Piggie Norimaki Bento, a photo by sherimiya ♥ on Flickr. Did not feel like cooking anything for bento, so I prepared the quickie backup bento of turkey dog rice and nori rolls. Not technically "sushi" but along those lines. I used a mixed rice (red, white and brown plus quinoa) for these rolls. After cutting into bite-size pieces, I decided to add little piggie faces to them, pink as they are. The rest of the bento contains the usual carrots, peapods, steamed broccoli and Okinawan sweet potato, strawberry, blackberries and lychee. Yes, lychee! I spied them in the markets here this past week, and I am extremely excited about it. As you can see, they are wonderfully white, juicy and sweet: my favorite fruit of summer. Well, early summer. Until mango season. Heh. Oooh I'm so jealous of your lychee! We don't have any yet. I'm not that big of a hotdog fan, but... those are making me want a hotdog real bad, lol! Very cute! Hotdog Maki is my daughter's favorite "sushi"!! 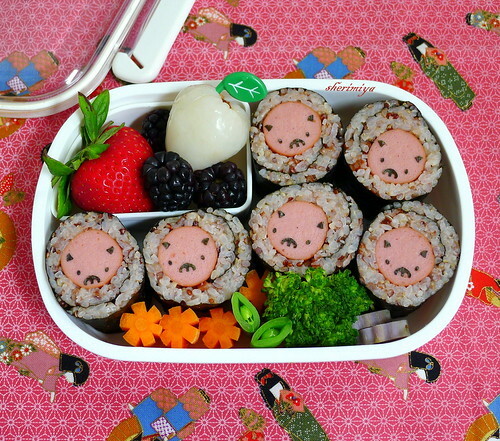 Outstanding bento freshness and cuteness with a fruit choir that makes my heart sing! Aww, those piggies are so cute. I want to make them now. I will have to get the appropriate items soon. You should, it's so easy. Thanks MewlKitten! So cute! Love your selection of food! Would feel like a very bad wolf eating all these cute piggies!! Too cute! The lychee here aren't as good as the ones in Hawaii, but of course I'll take what I can get. Same with mango! 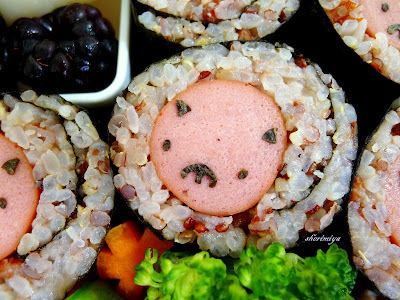 That is such a cute idea to use sausage inside. Cute! I love your bentos! So cute and so healthy! Can you tell me how you make the rice with quinoa? Thanks So much! I toss everything into the Zoji rice cooker together and cook it on the quick setting (about 30-45 minutes). If you are more organized, you can wait to add the quinoa until there are only 20 minutes remaining. Hope this helps!